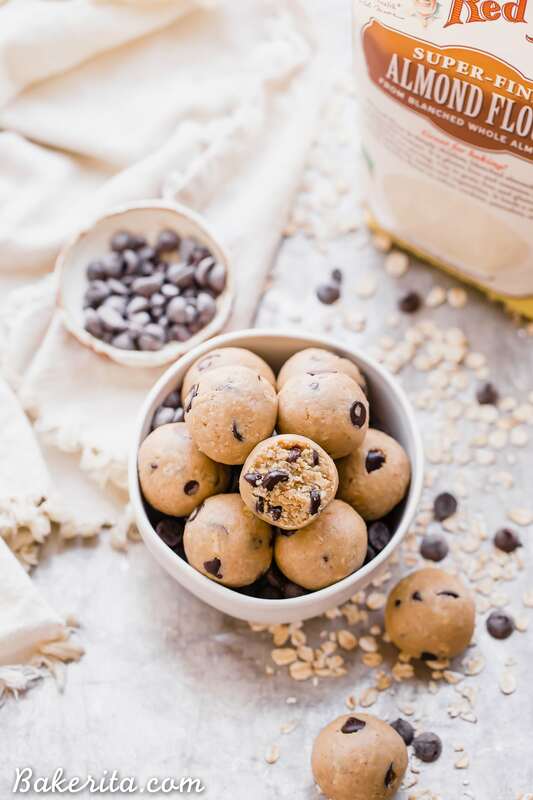 If you’re always eating spoonfuls of cookie dough out of the bowl, these Oatmeal Chocolate Chip Cookie Dough Bites were made for you! 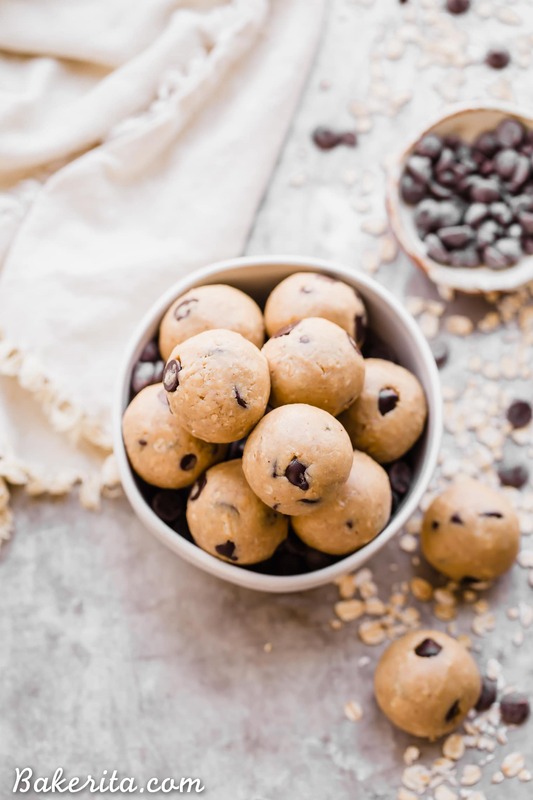 These gluten-free and vegan cookie dough bites are made in five minutes and are sure to satisfy your cookie dough cravings. This post is sponsored by Bob’s Red Mill. Happy Monday! 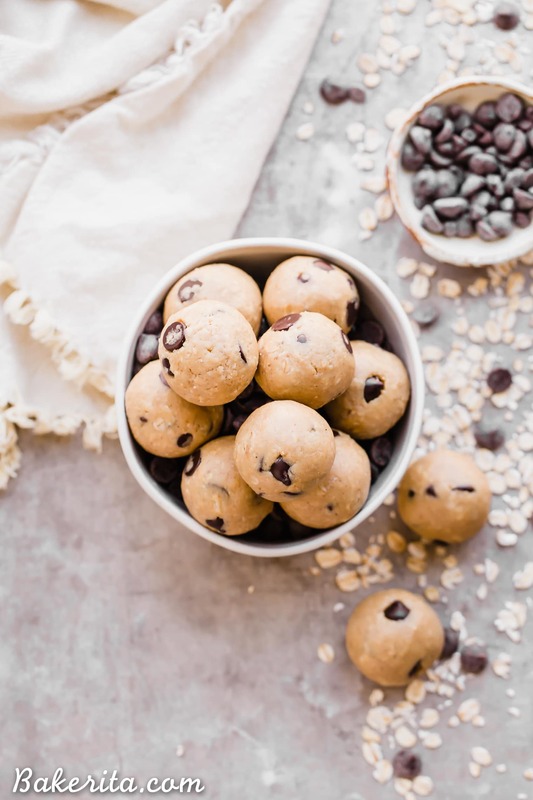 If there’s anything that can kick your week off on the right foot, it’s these oatmeal chocolate chip cookie dough bites. Because let’s be honest, if cookie dough can’t make you feel excited for the week…what can?! I seriously can’t believe how easy and delicious these are, and I’m now kicking myself for it taking me so long to come up with this recipe. I could’ve been eating cookie dough bites for YEARS. First off, we’ve got cashew butter. I like using cashew as opposed to almond butter or peanut butter because I find it has a delicious buttery flavor that’s perfect for a cookie dough flavor. However, you can definitely use whichever nut or seed butter your heart desires (or just whatever you’ve got on hand). Maple syrup is in there for some sweetness. I’m sure honey would also work, but the flavor is typically more noticeable than maple syrup, which is something to be aware of – and using honey will make the recipe not vegan-friendly, so use maple syrup to keep it vegan. The cashew butter and maple syrup are mixed up with vanilla extract, kosher salt, blanched almond flour and gluten-free oats. I used Bob’s Red Mill blanched almond flour and oats, as usual, because I can always count on them to be certified gluten-free and of the highest quality. I used a combo of their rolled oats and their quick cooking oats because I was feeling indecisive, but either would work here. Just remember that using rolled oats will give more texture and chew, while the quick cooking oats won’t be as noticeable texture-wise. 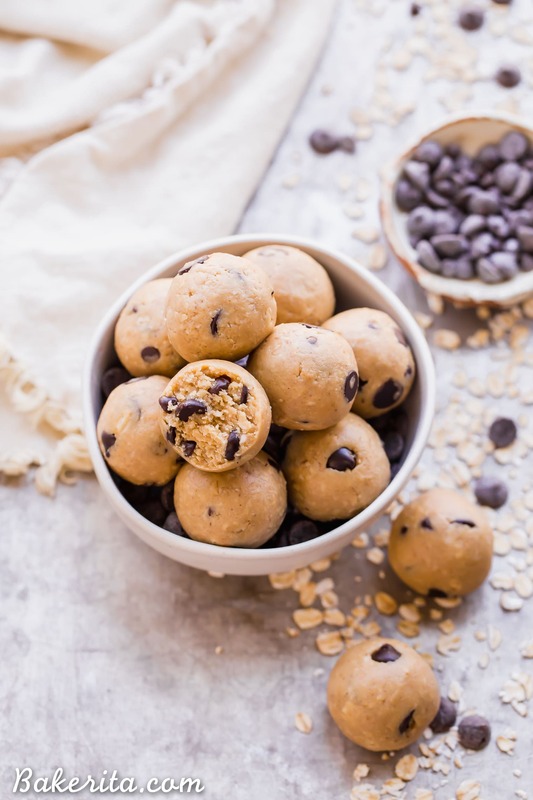 These Oatmeal Chocolate Chip Cookie Dough Bites are nothing short of irresistible! If you were the kid (or adult) always sticking your fingers in the cookie dough bowl for a snack, these were made for you. I’ve been loving them as a quick snack or even dunked in tea for a late night dessert treat :) however you devour them…enjoy! 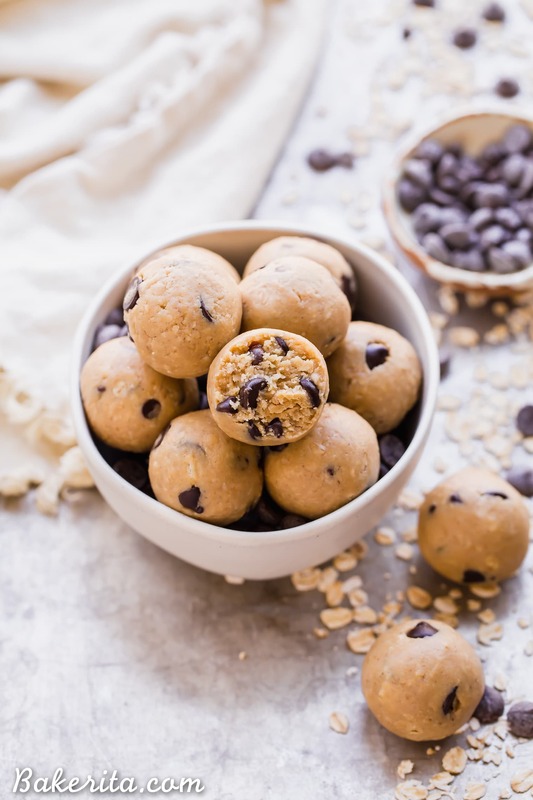 If you're always eating spoonfuls of cookie dough out of the bowl, these Oatmeal Chocolate Chip Cookie Dough Bites were made for you! 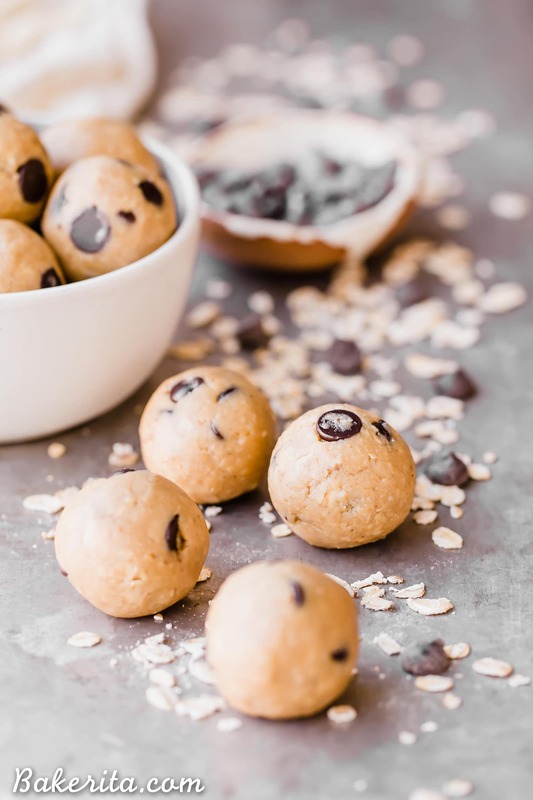 These gluten-free and vegan cookie dough bites are made in five minutes and are sure to satisfy your cookie dough cravings. ½ cup (45g) gluten-free oats I used half quick cooking, half rolled oats for texture - use whichever you prefer or have on hand, or a combo like me! In a mixing bowl, stir together the cashew butter and maple syrup. Stir in the almond flour, gluten-free oats, salt, vanilla extract, and chocolate chips. Roll the dough into 12 balls and store in an airtight container in the refrigerator for up to 2 weeks. I used a combo of rolled oats and quick cooking oats, but either would work here. Just remember that using rolled oats will give more texture and chew, while the quick cooking oats won't be as noticeable texture-wise. This post is sponsored by Bob’s Red Mill. As always, all opinions are my own. Thank you so much for supporting the brands that support Bakerita! I had a small jar of homemade vanilla bean cashew butter I wasn’t in love with so this was the perfect way to use it up. So yummy! Thanks for a super easy & delicious recipe! Hmm, if you did, you’d only want to use about 2 to 3 tablespoons because it’s much more absorbent than almond flour! These are to die for! I could eat them all day long. I used half cashew butter and half mixed nut butter and the flavor is just incredible. The oats add just the right amount of texture too making them the perfect treat! You’re my hero. OHEMGEE I love these bites! Thanks so much for the love Kayle! These are amazing!!! I used organic unsalted chunky peanut butter (because that’s what I had but so delicious- like a PB cookie! ), quick oats (I pulsed myself in my Vitamix), agave instead of maple syrup, and cocoa nibs instead of choc chips! I made bigger balls so it didn’t make as many…or maybe because I couldn’t stop eating the batter!! Thanks for a great recipe! I’m bringing some to work tomorrow for an energizing snack! Would it turn good if i bake them? Not sure, the recipe wasn’t developed to be baked. If I use agave, how much would I use? And does the almond flour need to be “blanched”? Hi Barb, you can use an equal amount of agave as there is maple syrup. Because these balls aren’t baked, it’s not super important that the almond flour is blanched. Enjoy! So good! I’m always craving something to go with my coffee in the morning and one or two of these does the trick! I used mini chocolate chips and agree that a combo of rolled oats and quick cooking oats work well. Also makes a great quick snack for work. So glad I found your recipe! Thanks! THESE ARE AMAZING! I’d give them 10 stars if I could. I don’t love the texture of raw oatmeal, so I blend the oatmeal until it is a fine powder prior to adding to the mixture. So tasty! I also use whatever nut butters I have on hand: sunflower seed butter, almond butter, cashew butter, peanut butter, etc. I used honey one time as well, and they are great that way too! Needless to say, the recipe is very forgiving, and my friends and family love these every time! Can I substitute regular gluten free flour instead of almond? We have a tree nut allergy in the house ( peanuts are fine) so I plan to use peanut butter.